It’s one of the best times of year to be out exploring the open spaces of the Peninsula. The wildflowers are in full bloom and the landscape is bursting with color. Thanks to El Niño rains, California is having a terrific wildflower season, with the Bay Area’s peak bloom forecasted for April 10-25. If you haven’t already, seeing the spring bloom this year is a must! 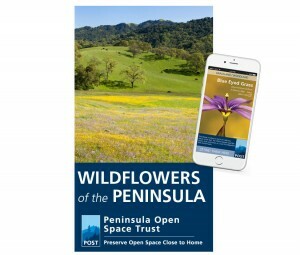 But before you hit the trail, make sure to grab our new wildflower guide – Wildflowers of the Peninsula. This easy-to-use digital guide will help you find and identify 15 of our favorite Peninsula wildflowers. It also recommends POST-protected properties for you to explore, and where these flowers grow. Download your copy here. POST is committed to protecting the diverse habitats that allow these flowers to thrive. This month, NBC Bay Area’s Open Road featured our work protecting mountain lions at San Vicente Redwoods. If you missed that episode, no worries! You can find that segment of the show here.